Editors: Crane, Russell D. and Heaton, Tim B. 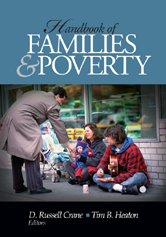 The Handbook of Families and Poverty covers hotly debated issues associated with public policy and funded research as they relate to families and poverty. Contributors, bringing multiple perspectives to bear, aim to show alternatives to welfare in subgroups facing specific challenges that are currently not adequately addressed by the welfare system.